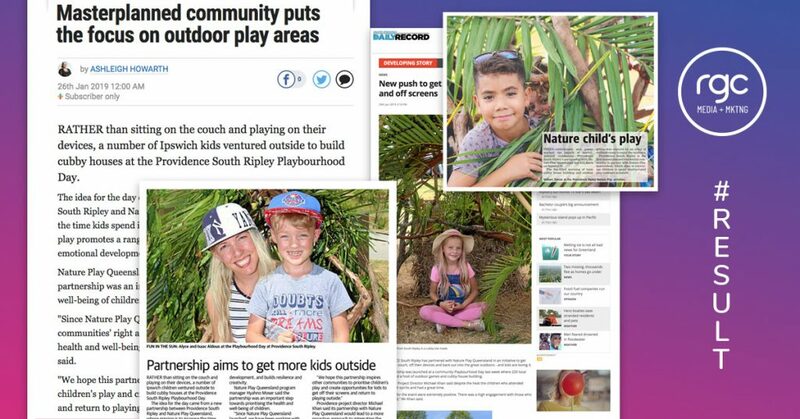 Providence South Ripley has become the first masterplanned residential community to partner with Nature Play Queensland (natureplayqld.org.au) as part of a comprehensive initiative to get kids off the couch, off their devices and back out into the great outdoors. This partnership will help shape Providence into a place for children to play freely outdoors and was launched at a community Playbourhood Day today (January 23) where local kids enjoyed a host of outdoor games and cubby house building. Providence is the largest masterplanned community in the Ripley Valley with nearly 700 families now calling the estate home. Nature Play Queensland’s mission is to increase the time Queensland kids spend in unstructured play outdoors and in nature. It is founded on the understanding that unstructured play outdoors – nature play – is fundamental to a full and healthy childhood. Nature play promotes a range of health benefits, including cognitive, social and emotional development, and builds resilience and creativity. Experiences in nature as a child also leads to environmental awareness and stewardship later in life. Providence Project Director Michael Khan said the project was proud to be the first property development to form a partnership with Nature Play Queensland. “Importantly, when you come into a community and you can see children outdoors playing, you know that it’s a safe, happy and connected community. He said Providence’s partnership with Nature Play Queensland would lead to a more proactive approach to integrating the principles of nature play into in the designs of parks and streets and the delivery of community activities and events. · Promoting walkability – ensuring pedestrian paths and cycleways linking throughout the community. · Welcoming front yard – front yard design helps bring back traditional neighbourhood connections as it enables people to say hello as they walk past, for kids to make friends and find playmates and to create a feeling of openness and connection. · Open space – Maximising open and community places and spaces for playing and connecting. · Safe streets – designing streets that are safer for kids by reducing speeding and ensuring kids can play and connect and neighbours can walk and socialize. Nature Play QLD Program Manager, Hyahno Moser, said the partnership was an important step toward prioritising the health and well-being of children in local neighbourhoods. “Since Nature Play QLD launched we have been working with communities’ right across the state addressing rising concerns around the health and well-being issues associated with children’s inactivity,” Mr Moser said.